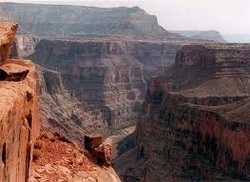 The Grand Canyon National Park is located in Arizona. People don't know how the Grand Canyon came to its form. They are sure that erosion did its part. It's a gradual process of wearing away soil and rock. This may be caused by gravel and sand, water from rushing rivers, rainwater, and by the wind. Erosion takes place all the time. The Grand Canyon will never stop changing its form. It is a beautiful sight to see! Part of the Southwest are desert. A desert is a place that gets less than 10 inches of rain a year. The rain may come in heavy downpours, but do not last long. 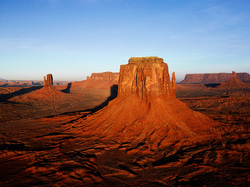 Part of the Southwest has arid climate. The are dry but they are not deserts. The states in the Southwest can go a long way without rain. The weather in the Southwest can change from windy to humid. A cactus called the saguaro naturally grows in the Sonoran Desert, wich gos into Arizona,pats of Mexico, and southern California. The saguaro is the symbol of the Southwest. The saguaro looks like a white, night-blooming blossom. The saguaro grows very well in the desert.